The Transportation Safety Board (TSB) of Canada says the new CPC-1232 tank cars are no better than the older DOT-111 tank cars that derailed, punctured, spilled 6.5 million litres of crude oil, and burned in July 2013, killing 47 people, seriously damaging the environment and leveling much of downtown Lac-Mégantic, Quebec. In a preliminary report on the February 14, 2015 derailment of a Canadian National Railway oil train near Timmins in northern Ontario, the TSB says at least 19 of the 29 derailed tank cars were breached or partially breached, releasing crude oil which was being shipped from Alberta’s tar sands region (Reuters). 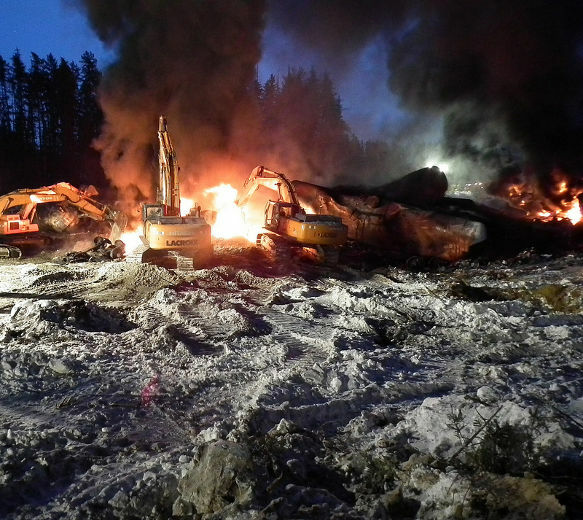 Seven of the derailed tank cars caught fire and burned for about 4 days. “Preliminary assessment of the CPC-1232-compliant tank cars involved in this occurrence demonstrates the inadequacy of this standard given the tank cars’ similar performance to the legacy Class 111 tank cars involved in the Lac-Mégantic accident”, said the Board. The February 16, 2015 derailment of a CSX oil train in West Virginia also involved the newer model CPC-1232-compliant tank cars. About 15 of 27 tank cars that derailed in that crash caught fire and spilled Bakken crude oil into Armstrong Creek and the Kanawha River. Considering this latest revelation by the TSB, one has to wonder whether it is actually possible to make shipping oil by rail safe. Visit this link for more information on the dangers associated with shipping oil and other dangerous goods by rail. ~ by railroaded on February 23, 2015.